For quite a long time, the Sprint Speciale version of the Alfa Romeo Giuli(ett)a was a poor relation of the Giuli(ett)a Sprint – heavier, slower, and with divisive styling that was ungainly from some angles and gorgeous from others. And for quite a long time, they remained one of the few 1950s Italian-designed, jet-inspired cars (think the BAT 5, 7, and 9 design exercises, or the Aston Martin DB4 Jet) that was affordable to your average enthusiast. That is, until the recent warm-up in collector car prices – now, a well-restored Sprint Speciale is a low six figure car, which is great since they get the restorations they deserve, but sad since they slip out of the reach of most enthusiasts. 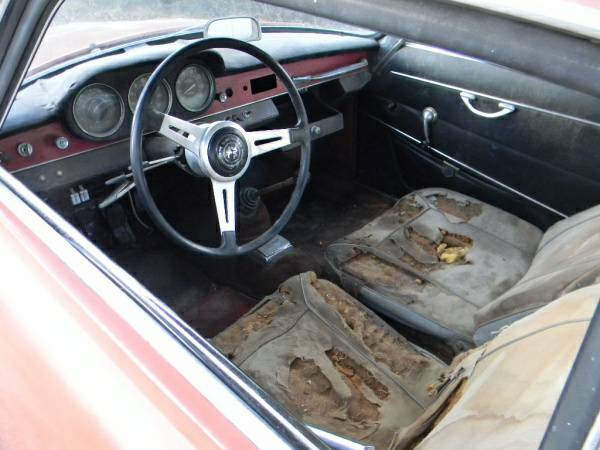 Once in a while, you get the chance (even if it’s not real) to dream about when they were still within reach – check out this 1964 Alfa Romeo Giulia Sprint Speciale for sale for $800 in Port Richey, FL. “Scam!” might be the first thought that runs through your mind, though the description does not read like your typical scam listing. As we saw on a smaller scale with the automatic BMW 2002 a couple of weeks back, there are still sellers out there who are unaware of the changes the last 5-10 years have brought to the classic car market. And while we can’t see enough of the naughty bits on this car, it does look to be straight and fairly complete, which is a good start. The overhead shot is just gorgeous – incredibly shapely and sensuous. 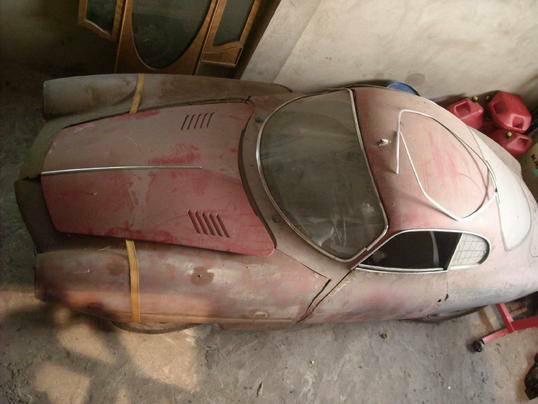 The car is said to have been sitting since about 1995, but looks as if it’s been longer. If it’s a Florida car, you can count on rust, and a closer look does expose some lacey-ness in the picture below. However, when the entire car is priced at the cost of, say, a bumper, it’s hard to go wrong. Evidently, the seller’s father attempted to get the car on the road ten years ago, so there must be something left of the structure. The engine is a normale with a single carburetor instead of the expected dual carburetted 121 engine, but if you’re really lucky the actual engine is still original. Again, if this car is truly available at this price, you can be happy of having any engine installed, even an American V8, but having a proper Alfa engine is perfect. 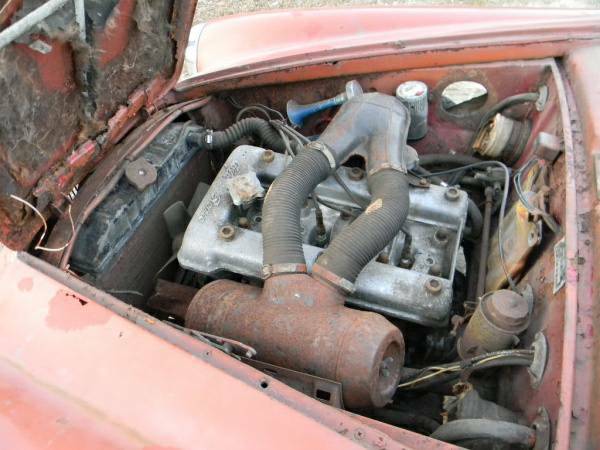 If you’re even luckier, the engine has not seized in spite of the humidity, and will run with some resurrection work – the Alfa four can be pretty hardy that way. Note grill and headlight trim for one side on the floor in front of the car. The passenger side headlight opening looks a little funny and there are some dents visible, but if the car is fairly intact, it would be fun to see how far you can get with it without a restoration. Work on a coach-built Italian car will not be cheap, but it doesn’t need to be perfect to be fun. Think you’re quick (or have a fast enough tongue) to get your hands on this one? This entry was posted on April 9, 2015 at 9:39 pm and is filed under Feature. You can follow any responses to this entry through the RSS 2.0 feed. You can leave a response, or trackback from your own site. It’s a definite scam, just one that is more clever than most. The indoor pics are from a car in Europe and the outdoor ones are a regular Giulietta Sprint Normale rather than a Speciale (explaining the single carb). 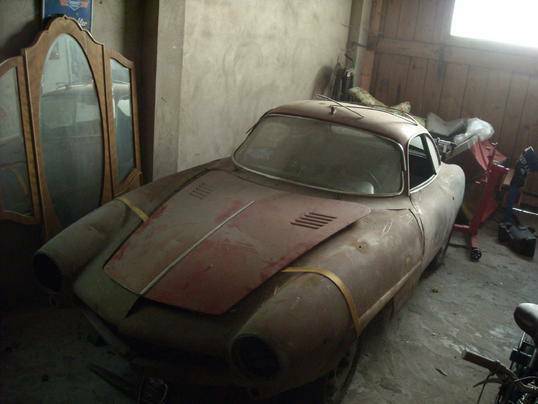 See this link on the AlfaBB for the running story: http://www.alfabb.com/bb/forums/alfa-romeo-cars-sale-wanted/406602-found-craigslist-800-sprint-speciale.html. Thanks Gil, that’s too bad… I got a little excited since someone had actually had a response from the “seller”. Honestly, it’s probably the only way an SS will show up here with the self-imposed $4K max.